With tongs transfer sprouts to a plate, browned sides up. Add garlic and remaining 1/2 tablespoon butter to skillet and cook over moderate heat, stirring, until pine nuts are more evenly pale golden, about 1 minute. Spoon mixture over sprouts and sprinkle with freshly ground black pepper. Serves 3-4 as a side dish. I served them with blackened chicken and sweet corn. 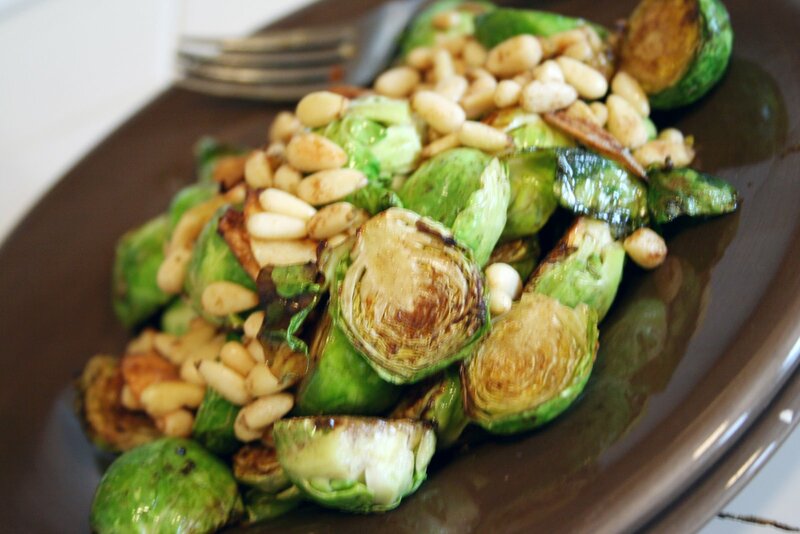 I don’t think I have ever actually eaten brussel sprouts before… is that bad? Can we still be friends? for the record…I never actually said they are “cute” but I do love them. I’m not sure what I was thinking with that descriptive term. When re-reading I laughed aloud. Now deleted. I think that you get better results slowly caramelising the sprouts in the oven rather than the pan, but either method makes them a world away from steamed or boiled sprouts. thanks for the tip phil…I’ll try that also!